Use the Geometry Editor dialog box to perform various operations to an object’s geometry component, such as assign a color and width to a shape, apply a border to an image, and set a finished output file format for the object. 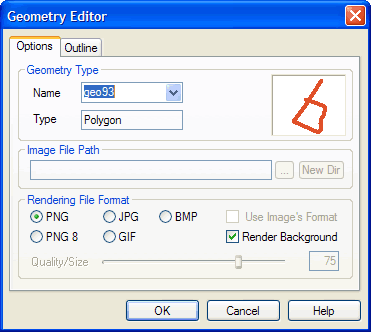 Perform various editing operations to an object’s geometry component using the Geometry Editor dialog box. Press the ALT+G keyboard shortcut. In the Geometry Editor dialog box, the geometry component most recently edited will appear selected, but you may select any geometry in the project from the Geometry Selection drop-down menu.